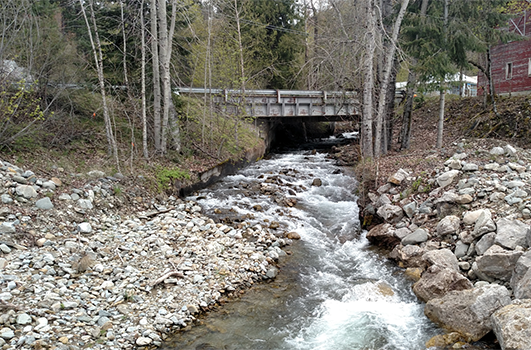 Construction to replace the bridge over Strong Creek on the business route of Idaho Highway 200 will start the last week of February. Work is expected to last until late June. During that time, the highway will be shut down completely with a detour route posted. Pedestrian access may be provided depending upon the contractor’s resources. Toward the end of construction, flaggers may be able to allow alternating, one-way traffic over the structure. Workers are expected to be on site during the day throughout the week, though activity over the weekends is allowed. A meeting will be held at the Memorial Community Center in Hope on Tuesday, February 12 from 5 p.m. to 7 p.m. It will be primarily for emergency services, but all members of the public are welcome to stop by at any time to ask questions. The new structure will feature a concrete sidewalk with accessible ramps.